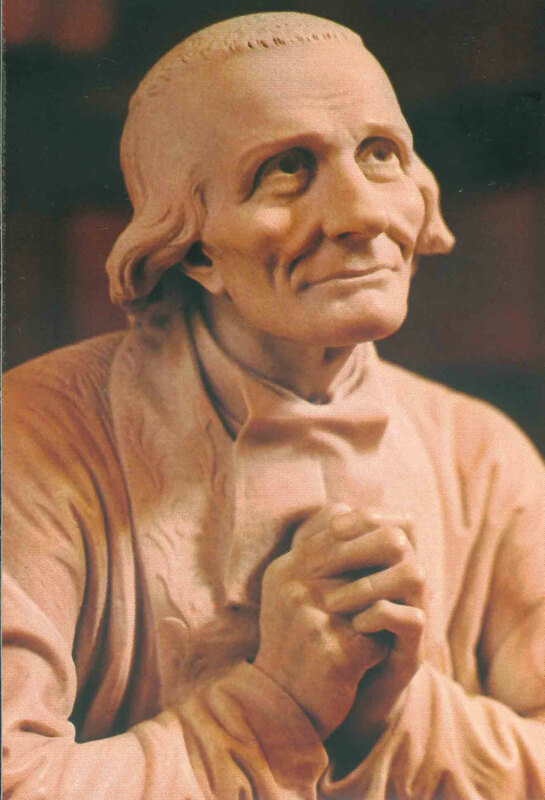 The Catholic Church in Fort Assiniboine was named after St. John Vianney, a patron Saint who was born in 1786 in Dardilly, France. St. John Vianney was a farmhand who taught other children their prayers and catechism. He went into the priesthood at the age of 19, at a time when the government had control of the Church and many priests were forced to go underground.Vianney had great difficulty learning, especially Latin. It took years and the constant support of a bishop for Vianney o be ordained a priest. The Bishop interceding for him was asked “Is Vianney devoted to God?” “Yes” the Bishop answered. “Good then, let the Holy Spirit do the rest”. Vianney became a priest at 25 and was assigned to the parish of Ars. He spent days in prayer doing penance for his parishioners. His direction was characterized by common sense, remarkable insight and supernatural knowledge. He would listen to confessions for 18 to 20 hours per day and thousands came to hear him preach and to make their reconciliation because of his reputation with penitents. For 40 years his food and sleep were insufficient, humanly speaking, to sustain life. And yet he labored incessantly, with unfailing humility, gentleness, patience and cheerfulness, until he was more than 73 years old. He spent 40 years as a priest and died on august 4, 1859. He was canonized in 1925. The arrival of the railroad at the new Barrhead site in 1927 resulted in settlers and the forming of a new business community and the need for more churches. There had been Catholic Missions throughout the district and a small church had been built at Mosside. At that time there were few settlers at Fort Assiniboine. Fr. Rooney traveled and would say Mass at the home of Mr. and Mrs. J. Walsh who lived in the area. In 1936, a newly ordained priest arrived. Fr. Poirier was appointed Parish Priest of Barrhead and Missions. Many homesteaders were heading to the Fort Assiniboine area and Mrs. Walsh felt that her house was not large enough for all the parishioners of Pride Valley, Holmes Crossing, Topland and beyond, who attended Mass on Saturday morning once a month. She discussed this with Fr. Poirer and decided to donate a parcel of land which is where the church was built. Construction beg an on the church in 1948. Under the direction of Fr. Poirier the church was built by local people. Many people volunteered their their labor. In 1949 Fr. Poirier finished work on the inside of the church. He made all the pews and the parishioners paid ten dollars per family. Bishop Baudoux came out with Fr. Poirier to bless the church, giving it the name and placing it under the patron Saint of priests, ‘St. John Vianney’. 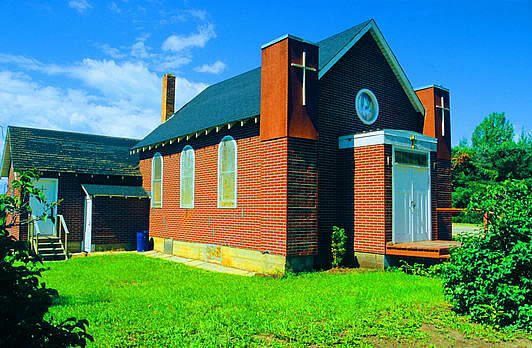 In August 1948, the St. Paul Diocese was formed and Barrhead and Missions were no longer under the Edmonton Diocese. Between 1948 and 1960, the congregation grew smaller because many families moved and some parishioners passed away. Fr. Poirier became ill and went to Edmonton in 1962. Fr. Terre held services for about three years, followed by Fr. Tanguay and Fr. Edmond Croteau. Today, being part of St. John Vianney church means being part of a group. Everybody helps when it is time to look after the grounds and the building. All the hardwood floors were refinished, the inside of the church has been repainted, stained glass window was replaced and the inside of the entry was renovated. The church is heated by a wood heater, which means wood must be cut and hauled before Mass. Throughout the year, the church is ‘dressed up’ with appropriate decorations and inspirational postings. The most awesome decorations appear before Christmas when the church is the starting point for the ‘Journey to Bethlehem’. Over 1000 people come in before they begin their journey through time. Most of the parishioners help in various ways during this non-denominational event that takes place in the last two weeks in November. Mass was served every Saturday at 5 p.m. until June 2013 when the Diocese of St. Paul decided to close the church. On July 13, 2013, the last Mass was served. In 2014 (when?) it was decided to have Mass once a month at the church. Every last Wednesday of the month, Mass is being said at the church, starting at 7 p.m.